Formally known as the Thao Maha Phrom Shrine, Erawan Shrine in Bangkok is of Lord Brahma the great. One of the famous temples in Bangkok, the four-faced Brahma God was built during mid 1950s and is considered to the most auspicious. If you want to experience a popular worship, this is the right place to do so, as it also features some performances by Thai dance groups which are wonderful. The Shrine is usually crowded with a lot of worshippers who offer their prayers on a daily basis. Surrounded by a small beautiful park, you will feel refreshed even if you spend couple of hours relaxing midst the area. How popular is Erawan Shrine? People normally also visit Jim Thompson House while planning their trip to Erawan Shrine. 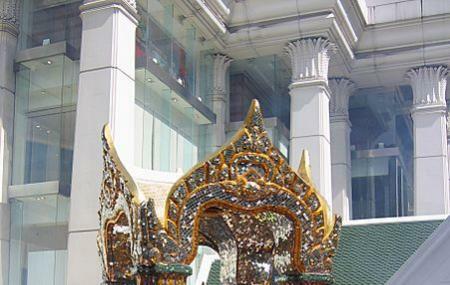 This is a holy shrine outside the Erawan mall. People from all walks of life come and pray to Buddha for happy life. There are dancers performing around the shrine and couple of souvenir shops. Do visit if you are a tourist. It is near big c and world trade centre and opposite of holiday inn. This is a sacred place where people of all walks of life comes here to offer prayers for good health, good fortune, blessings, seek forgiveness and many. Some people came here to seek advices and pray, hoping to find a good spouse while some pray hoping to strike big lotteries and win a fortune. The Thai people said this is the first shrine that was built before Bangkok. There offering of flowers, joss sticks, candles at a minimal price between 30 baht to 50 baht and also offering for traditional dance show to please the shrine. This place is one of the most famous shrine in Bangkok City Centre. Go and pray, you'll be granted your wishes but pray truthfully. I and friends pray and wish here many times, and most wishes are almost fulfilled. After which, make sure go back to offer your most sincere Thanks to the shrine. Its feels very sacred. All people are just praying to bramah god.. it feels so good right after you pray and wash your hands, arms and face to the blessed water on the left side of the shrine. Judging from the crowd:this must be a popular place to worship the four faced Buddha.You can buy flowers and incense for prayer but are not allowed to burn the incense for environment purposes. Thai traditional dancers will perform dances as well. A small spot to take a look if you are nearby. Feel not worth a dedicated visit from far away. Lots of prayers and have a shopping mall with good resturants. One star off as it's not that amazing or impressive, especially if you are not Buddhist.